Yossi Milo Gallery is pleased to announce Traces , an exhibition of black-and- white photographs by David Goldes, in the North gallery (531 West 25th Street). The exhibition will open on Thursday, April 19, with a reception for the artist from 6:00 to 8:00 pm, and close on Saturday, June 2. This will be Mr. Goldes’ third exhibition at Yossi Milo Gallery. David Goldes’ Traces features photographs of the mesh impressions of objects. 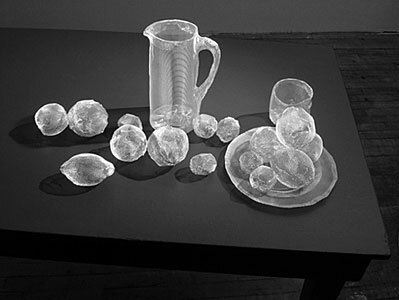 The artist shapes and molds metallic mesh around common objects, such as bowls, pitchers, fruit and architectural spaces, ultimately removing the figures to photograph the mesh outline of his subjects. Mr. Goldes’ photographs reveal the former presence of simple materials and arrangements, often based on Cezanne’s still-lifes, which have been transformed into ghostly remnants of their original models. Since his first show at the gallery, Mr. Goldes has shifted his focus from scientific experiments with water, fire and electricity, to his current explorations of imagination and memory. David Goldes’ new silver gelatin prints invite the viewer to consider what is recognized, imagined, or remembered. Educated initially in science, David Goldes received an MA in Molecular Genetics from Harvard University; he received an MFA from the Visual Studies Workshop/SUNY at Buffalo in Photography. His work is included in the permanent collections of the Museum of Modern Art, New York; the Whitney Museum of Art; the Art Institute of Chicago; the Walker Art Center, Minneapolis; the Yale Art Museum; the Museum of Fine Arts, Houston; and the Bibliotheque Nationale, Paris. He is a Guggenheim Fellow and a recipient of grants from the NEA, Bush and McKnight Foundations. Born in New York, Goldes currently lives and works in Minneapolis, where he serves on the faculty of the Minneapolis College of Art and Design.